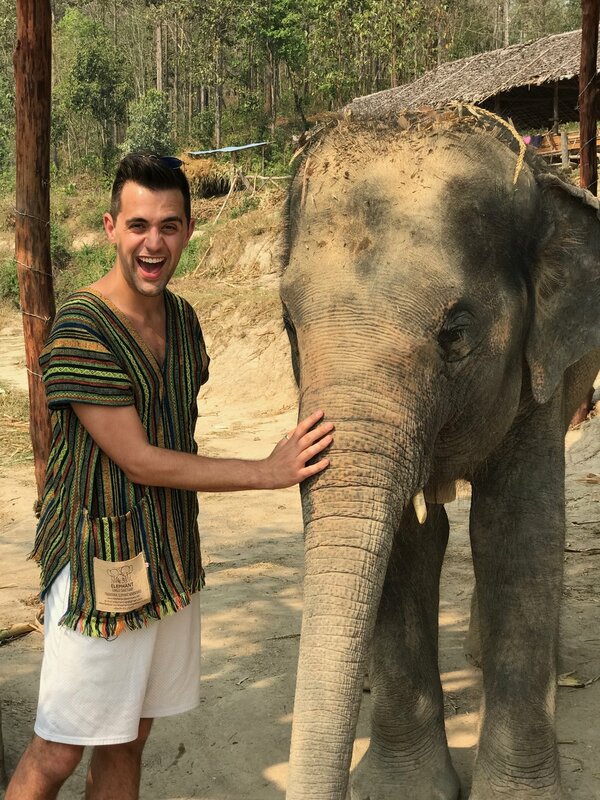 When we began planning our trip to Thailand we knew that we wanted to interact with elephants in some capacity. After doing extensive research, we quickly discovered the importance of why you shouldn’t ride them but instead volunteer at a sanctuary while visiting Thailand. 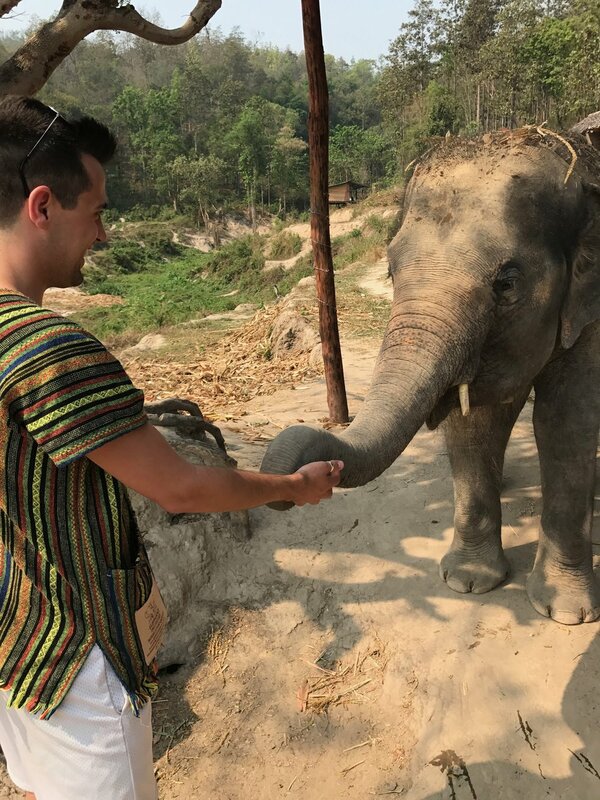 The Elephant Jungle Sanctuary in Chiang Mai was at the top of our search results because they provide a safe haven for elephants to roam freely in a controlled and natural environment. The sanctuary offers half day, full day and exclusive one day walks with elephants as well as overnight stays. We were fortunate to experience the Half Day at Elephant Jungle Sanctuary. We woke up bright and early on our first full day in Chiang Mai to be picked up at 7AM, from our AirBNB, by the Elephant Jungle Sanctuary “shuttle”. Shuttle is a loose term as it was more like the back of a pick up truck with the open air, comfortable benches and a rooftop. After picking up other guests throughout the town, we were officially on our way. We drove about an hour and 40-minutes outside of Chiang Mai with one pit stop about halfway at a convenience center. (Side note: there was amazing Thai Tea at the Amazon Cafe - highly recommended). Along the way, we spotted elephants in riding camps with large metal carriages on their backs. It quickly had us questioning our research as we wondered if what we were about to do was even ethical. After arriving to Camp 8 we were greeted by our guides and quickly educated on these beautiful creatures and the importance of elephant sanctuaries in Thailand. All of the facts they had to share quickly debunked any moment of ethical doubt we had on our way to the sanctuary. After a brief run down on the sanctuary’s history and how to safely interact with the elephants, it was time for their feeding. We were each given a handful of bananas and corn stalks to feed the elephants with. When given the command “bon” the elephants would open their mouths for you to feed them the banana. Once they had enough food, we brought them to fresh water for drinking before giving them mud baths. You’re probably thinking, “mud baths? ew!” however it’s an important part of an elephants daily routine to protect their skin, think of it like moisturizing. The elephants would playfully roll around in the mud bath while guests surrounded them rubbing mud upon their skin. The mud acts as a protection for the elephants from ticks and other insects. During the summer, elephants use the mud as a method to keep themselves cool on hot days. Once their mud baths concluded we walked with the elephants to the river to rinse off. We were given buckets to playfully throw water on the elephants as well as the other guests - the water was freezing! Before we knew it, our time with the elephants had come to an end. We were given a delicious Thai meal before being shuttled back to our accommodations in Chiang Mai. If you ever visit Thailand (especially Chiang Ma), we highly encourage you to NOT ride the elephants but instead, volunteer at a sanctuary. The entire experience was equally exciting as it was educational, and we walked away with amazing memories that will last us a lifetime. To learn more about the Elephant Jungle Sanctuary, click here. Watch our experience at the Elephant Jungle Sanctuary by visiting our YouTube Channel! 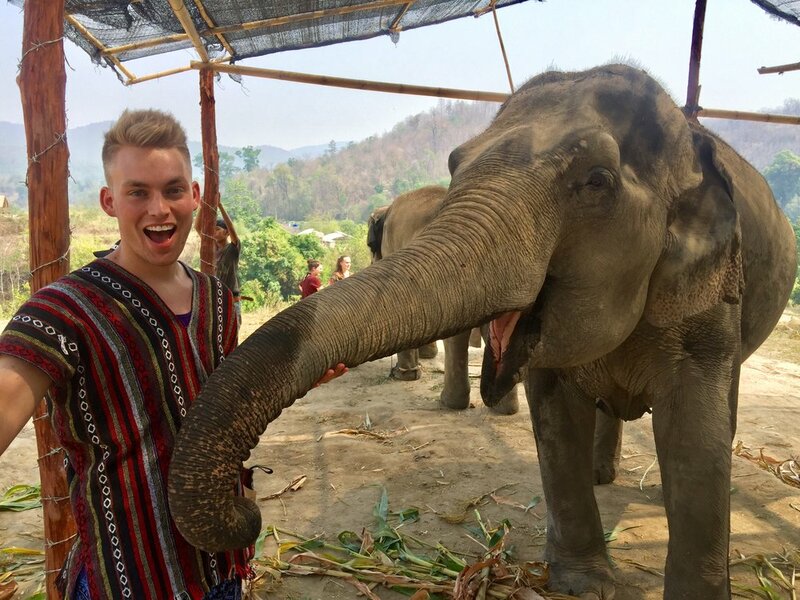 If you want to be educated on the importance of elephant sanctuary’s in Thailand - Watch James’ video by clicking here: Where’s Wallington - Elephant Jungle Sanctuary.